The issue I explore in this chapter began with my decision to investigate the history of how science came to know about the relationship between boiling point of water and air pressure (Milne C. Creating stories from history of science to problematize scientific practice: a case study of boiling points, air pressure, and thermometers. Paper presented at the twelfth biennial international history, philosophy and science teaching (IHPST) conference, University of Pittsburgh, PA, June 19–22, 2013). My studies into the history of this relationship led me to realize how much I had taken an instrument, the humble thermometer, for granted. This experience led me to realize that a focus on conceptual elements of science with an emphasis on theory development can seduce educators into ignoring the cultural affordances of the material practice of scientific instruments. 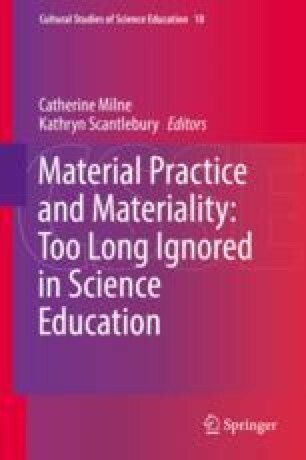 I explore the question of why there is so little attention given to understanding the role of instruments in the construction of knowledge, especially in science education.